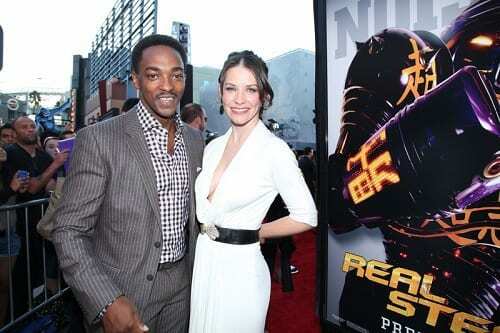 Anthony Mackie commands the screen in Real Steel. That is not an easy task given he stars opposite the hugely talented Hugh Jackman, the absolutely adorable Dakota Goyo -- who plays Jackman's son -- and nine foot tall robots who box as smoothly as the man who choreographed their fight sequences, Sugar Ray Leonard (don't miss our Sugar Ray Leonard interview). Mackie visits with Movie Fanatic for an exclusive interview about Real Steel, but also his ever-building career that has seen him steal scenes from Matt Damon in The Adjustment Bureau, Jeremy Renner in The Hurt Locker and Anna Faris in What’s Your Number? The star in the making also lets us in on his upcoming work including Gangster Squad with Ryan Gosling and the hotly anticipated Abraham Lincoln: Vampire Hunter. Movie Fanatic: What was the shoot like for you? How would you compare it as opposed to some other shoots you’ve been on? Anthony Mackie: Real easy. Shawn (Levy, director) put everybody in a position to succeed. I thought it was a lot of fun. It was really economical in that everything on the set just worked. From Craft Services to the CGI guys -- everyone was in sync. Shawn really made everybody do their job. Movie Fanatic: What was your reaction once you first saw the real robots on the Real Steel set? Anthony Mackie: I was flabbergasted. I believe in stuff going wrong. When I see a robot, it’s the Jack Bauer effect: If something’s not right you shoot it and ask questions later. I was freaked out by it. I had never seen anything like it. I didn’t even think it was possible to create nine foot tall robots like that motioning and moving around. It was too much. Robots don’t do that where I’m from [laughs]. My first thought was: We got to shoot it. Movie Fanatic: Obviously a great scene between two actors is like a tennis volley. What was the time with Hugh Jackman like? 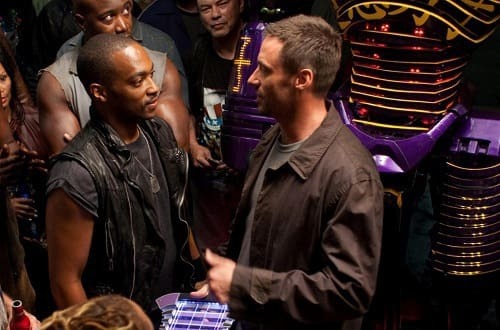 Anthony Mackie: Working with Hugh was fun. He’s a really smart actor. He gets what it takes of him. He knows the actor across from him doing a good job is not taking anything away from him. Whereas a lot of actors, you do your coverage, all of a sudden you turn around and they’re doing something completely different. Hugh was really humble, really cool, and really fun. Everything was about the movie. If I was doing something and I didn’t feel quite right about it, I could ask him about it and have a conversation as two actors trying to figure out a beat or a moment in a film. He’s the smartest, most humble, fun guy I’ve met in this business. Movie Fanatic: That’s saying something. Anthony Mackie: He has every right to be an (expletive) and he’s not. Movie Fanatic: What kind of backstory did you give your character Finn? There could have been a lot of avenues you went down mentally with him. Anthony Mackie: For me, the big thing was him wanting to be the best of the best. He wanted to figure out how to control this underground boxing world. When you’re looking at it, there has to be a way for people to fight their way to the top. When you look at Finn, he really wanted to explore the opportunity of using his love of boxing with his lack of skills and take it to that next level of promoting and facilitating people to get their boxers to that next level. He loved Charlie (Jackman) and he always adored Charlie as a boxer. So, when he met him, he was impressed. To be an underground boxing promoter and have somebody like Charlie fighting at my place, that’s a win-win for everybody involved. You don’t have to pay me to fight. You can fight for free. Movie Fanatic: The movie is about robot boxing, but it is really about so much more. What was it about the story that most resonated with you? Anthony Mackie: I feel that I grew up in the age of the non-traditional American family. I think what resonated so much was the ability of the parent to try and find or conjure some sort of relationship with a kid. A lot of time on film there’s a fictitious relationship between parent and child. Whereas if you find something you and your kid are both truly interested in, it makes the bond all that stronger. And Charlie and his son in Real Steel have that. When I read that in the film, being a parent, it really hit home with me. It was poignant. Movie Fanatic: Is working with CGI a challenge as an actor? I know there were those real robots you referred to, but there had to be some effects. Anthony Mackie: On this one, they had actors on stilts with the suits on. As actors, you invariably develop a relationship with them, so the guy who was playing all the bad robots, we just joked around and talked (expletive) all day [laughs]. The guy who was playing the good robot, we actually became friends. It was really odd. But, we all had a good time and made fun of the idea of being involved in such an amazing project. Movie Fanatic: You’ve been kind of busy lately. You’ve got a movie out, What’s Your Number? -- and this Friday, of course, Real Steel. How has life really changed for you? I know you have no say when a movie comes out, but you have two movies on two different Fridays, that has to feel pretty good. Anthony Mackie: It feels great and I’m proud of both projects. I did What’s Your Number? for a very specific reason. I wanted people to see me in a comedic light. When you see Real Steel, I did it for a very specific reason. I wanted people to see me in an action film. People don’t think you can do something until they see you do it. I’m just trying to give people the opportunity to see me do everything until that question is no longer relevant. Movie Fanatic: Well you killed it in comedy. If it’s possible to steal a scene from Anna Faris, you did. Anthony Mackie: [Laughs] Thanks, man! Movie Fanatic: How was filming Abraham Lincoln: Vampire Hunter? It’s finished, right? Anthony Mackie: Yeah, we finished a few months ago. Anthony Mackie: There’s something done with this movie that it's going to be a trendsetter the way The Matrix and Avatar were. I think working with a re-contextualization of history, it puts this film in a completely different mold. I think because of that, people are going to be drawn to it. Especially when they see the trailer, so stay tuned!